Local businesses are jumping on the opportunity to rethink the use of the space around Robson Square after police raided an illegal marijuana market there on Sunday night. 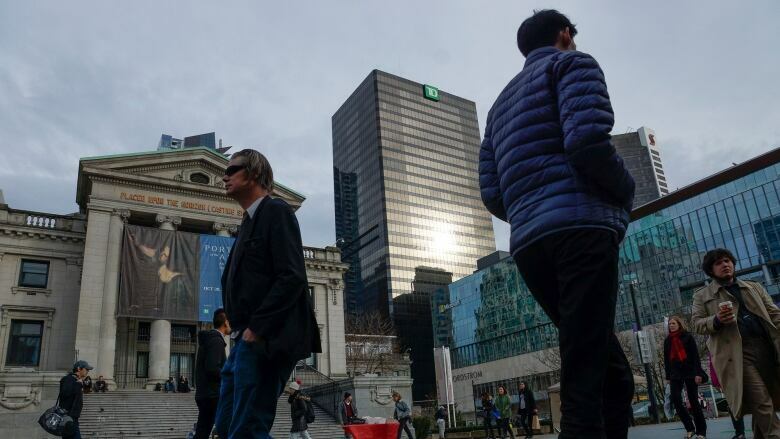 Charles Gauthier, president and CEO of the Downtown Vancouver Business Improvement Association, says there is always a risk with having a space that appears to be up for grabs. "You can't just leave it vacant. You need someone to curate it," he told CBC Early Edition host Stephen Quinn. During the recent police crack down, several people were arrested on drug possession and trafficking charges. More than nine pounds of dried marijuana and 23 pounds of edible cannabis were seized from the market that has popped up in recent months. Gauthier said he has received endless complaints from business members and the general public about the current state of the plaza. "I literally couldn't go anywhere without it becoming the topic of conversation," he said. "It wasn't welcoming to the majority of people." Nearly two years ago, in April 2016, Vancouver city council approved permanently closing the area to vehicle traffic in order to create a gathering space for people and activities. Despite being home to several special events, film sets and a giant Christmas tree over the past couple of years, the plaza has not yet fulfilled the initially proposed plans and won't until 2019. Gauthier said he wants to see a more concerted effort to bring in a variety of different activities from art galleries to festivals. "Whether it's someone from the city or another organization or a variety of different organizations that support it, that's what we need — someone who is actively looking for things to put in that space," he said. The business association agreed to the plan to close the area to traffic on a number of conditions, including that the space be maintained and used year round, Gauthier said. If the plaza remains unused during winter, Gauthier said, the city should consider letting cars and buses back in. "It needs to be on the table," he said. "If we leave it fallow during the winter months, we risk what we just experienced for the last couple of months where other groups will come in and take it over to the disadvantage of all of us."